Who is this woman in the Book of Revelation that is adorned in high fashion, expensive jewelry, wears a tiara, and advanced to the Divine throne of royalty? its course. Genesis 15:16 shows why God expelled the Amorites from the land in order that Israel might inherit Canaan. The reason he did not do so immediately was because the iniquity of the Amorites was not yet full. Their cup of sin yet had room for more and did not run its course until the time of the Exodus. 3. God Would Avenge All The Righteous Blood Shed on Earth By Mystery Babylon. The true identity of the beast and much much more! We’re so confident that this book will enlighten you in a positive way that we’re offering you a 30 day, no questions asked money back guarantee. Take a moment to read our promise to you. Note: Bonuses only available for a limited time, so act today. YES! I want these to experience the blessing of the Book of Revelation in my life, faith walk and ministry. 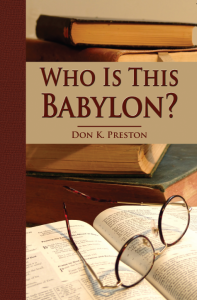 I understand I will be billed $19.95 today plus shipping for the “[Who Is This Babylon]” book. I will receive instant shipment of the book once my order is confirmed. I will also receive notices regarding delivery of bonuses via email. I can refund for any reason or no reason whatsoever within the next 30 days and the bonuses are mine to keep even if I decide not to keep the book! I’m sure you’re read a few books on Revelation and have said many times that there’s nothing new to discover. I felt the same way. I can only tell you what others have said…you’ll hate yourself if you miss out on this one. Press the order button now. You have everything to gain!